Card Text Reap: You may archive a friendly creature or artifact from play. Flavor text Nothing helps me think like wanton destruction. 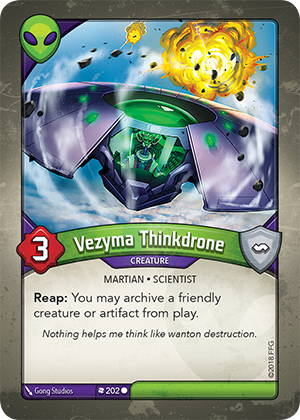 When I trigger Vzyma Thinkdrone’s “Reap:” ability, can I choose to have it archive itself? Yes. The only restriction is that the creature or artifact you archive is “friendly” (i.e. under your control). Therefore, you can choose to archive any friendly creature, including itself.